Bosnia and Herzegovina has to face a severe problem concerning stray and homeless animals, such as cats and dogs. There is a law for animal protection but, unfortunately, it is almost never enforced, thus most of public kennels euthanize stray dogs. 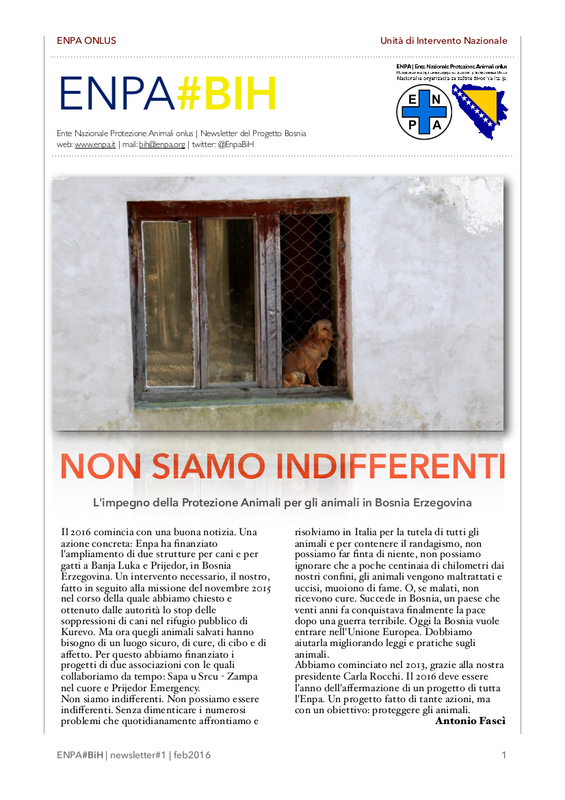 Enpa is involved in Bosnia and Herzegovina since 2013: thanks to its project named Rete Solidale (a project which aims at solving problems related to stray animals resorting to innovative strategies) and to its task force known as Unità di Intervento Nazionale it supports local volunteers and organizations also with in situ missions. This partnership has allowed for adoption of many stray cats and dogs. Enpa BiH is Enpa’s assistance program for animals of Bosnia and Herzegovina. The program is runned under the responsability of Antonio Fascì by the Unità di Intervento Nazionale- Servizio Guardie Zoofile Enpa .